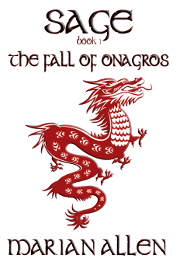 Here’s another excerpt from THE FALL OF ONAGROS, Book 1 of SAGE. Books 2 and 3 are due out by the end of this month. Oliva beren Audre kept cold silence as her son crossed her private sitting room and took the chair she reserved for his particular use. It had been his favorite at the Thanehold: outsized and overstuffed, perfect for lounging in odd positions. But Landry no longer lounged in odd positions. Landry now sat with regal dignity, even alone with his mother. If His Grace ever sprawled or lolled or folded himself in ways which looked uncomfortable but were not, his mother never saw it. His mother seldom saw him privately at all, these days. Despite her best efforts, Oliva was finding herself – and Corvina was finding herself, in a separate campaign – blocked from the font of royal power, and blocked by the font himself. Tonight, for example, Oliva had waited the Kinninger’s pleasure to grant her an interview, waited until long past midnight. In fact, the Thane suspected her son had gone to bed and had only come to her when he woke in the night and couldn’t sleep again. He said nothing now, but waited for her to speak. Landry smiled a little, and inclined his head. He had waited long to hear such words in such a tone from her. Landry inclined his head again. Landry rose and for the first time in years willingly kissed his mother’s cheek. Oliva saw him out, not entirely pleased with the interview, but not entirely displeased, either. Landry had held her firmly in the place he had relegated to her. He had taken her advice, though he had plucked the project from her hands and dealt with it himself. Landry was no longer swayed by his mother’s counsel. Oliva was content to see if his tender wife might not be swayed by her mother-in-law’s, and his heirs by their grandmother’s. The Kinninger’s mother dreamed that night – dreamed of placing a crown on the head of a faceless child. The crown settled over the child’s head, onto its shoulders, and tightened into a collar. The crown stifled the child, but Oliva held the other end of an invisible leash and she made the body move to suit her purpose. No one but Oliva knew the child who wore the crown was dead. Ain’t that sweet and tender? No? You’re obviously not an adherent of the House of Sarpa, then. A WRITING PROMPT FOR YOU: What is your main character’s relationship with his/her mother? Has it always been the same? If not, how has it changed? This entry was posted in SAGE, Sample Sunday. Tagged motherhood. Great excerpt. Makes me think of that Norman Bates fella. There was a mother/son relationship. No?